The newcomer group which took the Kpop world by storm last year, 2NE1’s first minialbum title song ‘I Don’t Care’ is announced as Cyworld 2009 Best Hit Song. According to Cyworld 2009 Annual popular song chart, 2NE1 ‘I Don’t Care’ is #1. The song is composed and written by YG Entertainment producers Teddy and Stony Skunk, and has been revealed in various versions like electronic, house, unplugged and musical versions, one of the hot topics of Kpop world last year. There has been some disagreement between the same names of Brown Eyed Girls Jea (제아) and upcoming 9-member group ZE:A (제아). ZE:A is the name of an upcoming 9-member group previously known as Child Of Empire under Star Empire Entertainment. The group has revealed some album jacket photos on 28th December and will be releasing their debut album on 7th January. But this has met with some strong protest from Brown Eyed Girls JeA’s fans. The reason is that they have the same name (in Korean that is). And it has been known that the fans have been calling up Star Empire to ask about the same-name issue. 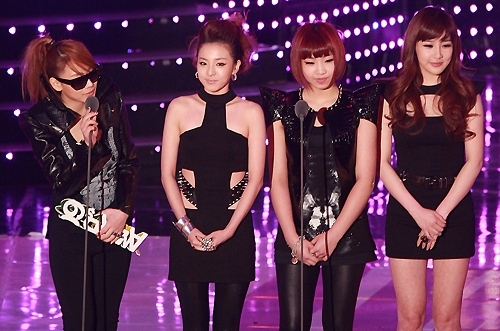 2NE1’s ‘I Don’t Care’ has been chosen as the top selling song of the year on Monkey 3. Music specialty site Monkey3 (www.monkey3.co.kr) collated results from its charts for the period of 1st January till 20th December 2009 including streaming and download charts, and then came down with ‘This year’s best song’. And the results show 2NE1’s ‘I Don’t Care’ at #1 and Big Bang-2NE1 collaboration ‘Lollipop’ at #2, So Nyeo Shi Dae ‘Tell Me Your Wish’ at #3, Brown Eyed Girls‘ ‘Abracadabra’ at #4, and GDragon’s ‘Heartbreaker’ at #5. SBS Gayo DaeJun rehearsal photos – 2NE1 and Big Bang for joint stage? Some photos from SBS Gayo DaeJun full dress rehearsals have been revealed. And the photos revealed that we may be in for some fantastic special stages like a joint-stage between 2NE1 and Big Bang members. Go under the cut for the photos. 4-member newcomer girlgroup 2NE1 appeared on MBC variety show for the first time since their debut! The girls were guest appearance on MBC ‘Sunday Night – DanBi’ aired on 27th December. This is the first time the girls appear on MBC variety program in 7 months since the girls debuted in May. The girl had taken gone up from Busan station to Seoul station from 7.45am in the morning in the cold weather of negative 12 degrees together with the MCs on the show Kim YoungMa, Tak JaeHoon, Ahn YoungMi and Kim HyunChul. The show that day was a ‘2009 DanBi Train’ special which talks about the heartwarming stories of heroes in the past 1 year under the program ‘DanBi’. And2NE1 had met with these heroes living in different parts of Korea on the train and did a special event with them. Singer actor Lee SeungGi and So Nyeo Shi Dae have been voted the male and female most active entertainers for year 2009. On KBS Entertainment Weekly aired on 26th December and a year-end star questionnaire was conducted with KBS Broadcasting Culture Research Institute and the 2 were voted the most active entertainers of the year. Lee SeungGi emerged #1 with 20.3% votes with both his drama SBS ‘Brilliant Legacy’ and also participation in filming of KBS ‘2Days1Night’ achieving as high as 70% viewerships on his TV appearance, also he has received acknowledge for his vocal capabilities. Many of you know that Girls Generation placed first in the year rankings on Music Bank. But did you guys catch the little mix up before it?